White Galentine Badge. 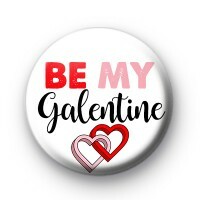 This fun slogan badge is for the new craze of Gal Pal style Valentine's Day. It has the text Be My Galentine written in fun font and two red and pink love hearts at the bottom. It is the perfect day to celebrate your girlfriends, partners in crime and share the love. It is such a fun badge and we all need to be supporting our sista's and showing them just how much their friendship means to us.